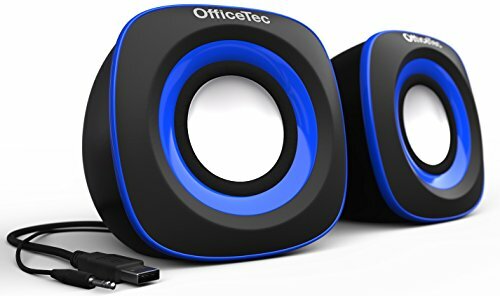 OfficeTec USB Speakers Compact 2.0 System for Mac and PC (Blue) by OfficeTec at Pacs BG. MPN: LYSB01HOUY9XC-CMPTRACCS. Hurry! Limited time offer. Offer valid only while supplies last. Powerful for the size: produces clear and crisp sound in a tiny package. Space saving: 3" x 3" x 3" dimensions saves precious desk space at home or the work office. Perfect travel companion. Wide compatibility: works right out of the box with desktop PC's and laptops, Windows, Mac, and Raspberry Pi. USB powered speaker system with 3.5mm audio input. Adjustable volume dial on rear of speaker. Total RMS Power: 3W (1.5 per speaker). 45mm speaker drivers. If you have any questions about this product by OfficeTec, contact us by completing and submitting the form below. If you are looking for a specif part number, please include it with your message.